Apple Pie! The most common and probably most famous recipe in the all world! There’ s an incredibly huge quantity of all possible types of recipes to make the perfect apple pie. Literally countless ways to make it! It’s one of my favorite cakes and what I’m proposing you is a traditional recipe of my mother. She was used to make the apple pie often on winter Sundays 🙂 When I make it at home, sweet childhood memories always come to my mind. This apple pie recipe from Tuscany is simple to realize and is very tasty! As you can see all its ingredients are very simple and genuine. My advice is to make it by hand, it will take a little more time but the result will be much better. First, take the butter, that should not be melted, but at room-temperature, and work it together with the sugar, then, one after the other, add just the eggs yolks. In another basin sift the flour with the baking powder, and add it with the pastry, working well. Finally whip the egg whites and add them as well, working very well. Grease a baking tin with some butter and sprinkle it with bread crumbs. 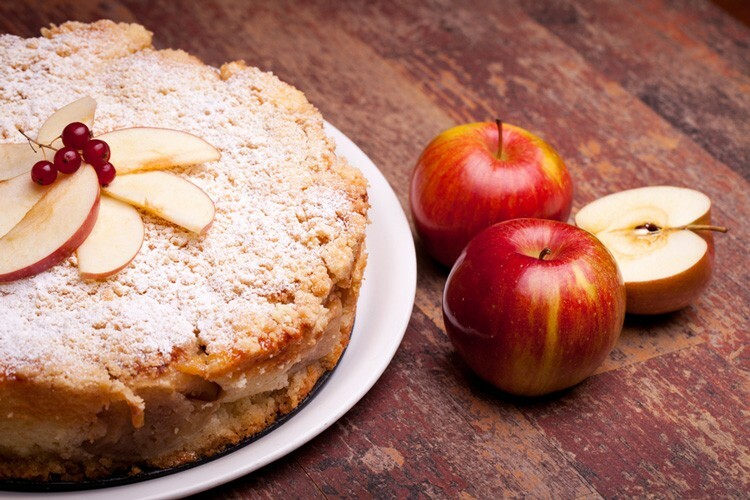 Cut the apples into thin slices and place them on the top of of the pastry, that you have already poured into the pan. Hi Elena, could you please tell me how much flour is required for this recipee. Do you use plain flour or self raising flour? Thanks. Can’t wait to try it. Let me know when you’ve done it! I’ll be waiting for your comments 🙂 Have a nice Sunday!